SHORTLISTED FOR THE 2017 BAILEYS WOMEN’S PRIZE FOR FICTION’There are things even love can’t do . . . If the burden is too much and stays too long, even love bends, cracks, comes close to breaking and sometimes does break. But even when it’s in a thousand pieces around your feet, that doesn’t mean it’s no longer love . . .’Yejide is hoping for a miracle, for a child. It is all her husband wants, all her mother-in-law wants, and she has tried everything – arduous pilgrimages, medical consultations, appeals to God. But when her relatives insist upon a new wife, it is too much for Yejide to bear. 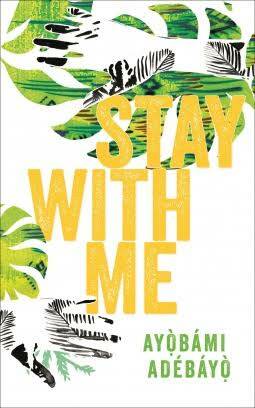 It will lead to jealousy, betrayal and despair.Unravelling against the social and political turbulence of 1980s Nigeria, Stay With Me sings with the voices, colours, joys and fears of its surroundings. Ayobami Adebayo weaves a devastating story of the fragility of married love, the undoing of family, the wretchedness of grief, and the all-consuming bonds of motherhood. It is a tale about our desperate attempts to save ourselves and those we love from heartbreak.